On the coldest of winter days, when I don’t have to go outside, I enjoy being at home in the kitchen with a project that may take a bit more time than the usual dinner preparation. One of the dishes I like to make on days when I have extra time is Japanese gyoza or dumplings. I learned how to make them when we lived in Japan years ago but have modified the recipe over time. I like to form the gyoza using a dumpling press, which speeds up the process and they look beautiful. You can boil the gyoza or pan fry and steam them. I prefer to pan fry because I like the bit of crunch the pan frying method adds. Gyoza are served with a dipping sauce. I also like to add them to soups such as Thai chicken coconut soup. Blanch cabbage in salted boiling water for 2 minutes, then drain it well. Squeeze out excess liquid from the cabbage, then finely chop. You want about 3/4 cup of blanched cabbage. Set aside. In a bowl combine both ground meats and egg. Mix well, then add cabbage, onions, garlic, and ginger. Mix well to evenly distribute. Next add salt, soy sauce, and sesame oil. Let filling sit for a few minutes so the flavors can develop. Take one potsticker wrapper and place in the palm of your hand. Dip your finger in the bowl of warm water and run it around the outside edge of the wrapper. 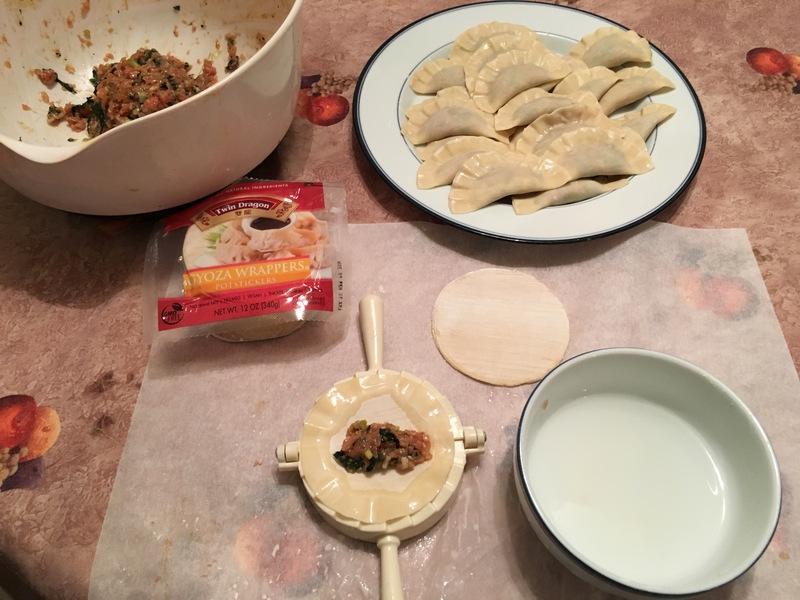 Place moistened wrapper in a dumpling press and add 1-1/2 teaspoons filling into the center, then seal shut with the press. Don’t overfill or the gyoza skins will split. (You can also do this by hand without a press by forming the dumpling into a half moon, pleating the edge as you go.) Place filled gyoza on a parchment-lined baking sheet. You can boil the gyoza as you would ravioli in salted boiling water for 5-10 minutes or until they float to the top. You can also fry the gyoza flat side down in a little oil and, once the bottoms are crunchy, add 1/4-1/3 cup of water and cover with a lid to steam for 1-3 minutes. Makes about 75 dumplings. To Serve: Whisk together dipping sauce ingredients. Place sauce in individual bowls and serve alongside cooked gyoza. This entry was posted in Appetizers, Chicken, Meat Dishes, Pork, Sauces. Bookmark the permalink. Well! I’d like the Thai chicken coconut soup, too! Lovely! The Thai coconut soup recipe is coming soon to the blog. I’ve almost got it ready.